Choose a bed & breakfast in Provence and the Riviera from a selection of 350 guest houses in Luberon, Camargue, Alpilles, the Verdon or at the seaside. To find charming bed & breakfast establishments in Provence, with or without table d'hotes, smart and sophisticated guest-houses, low budget B&Bs. 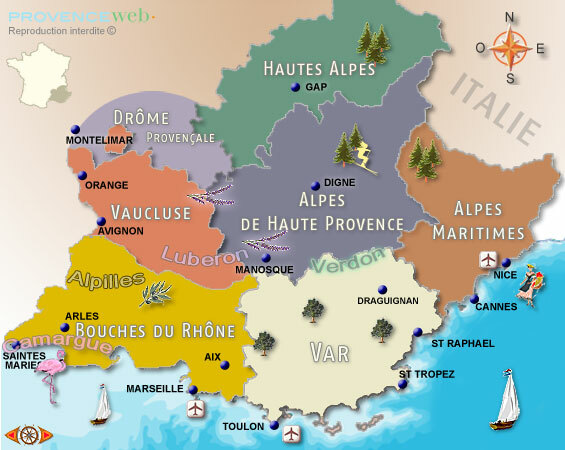 The ProvenceWeb portal enables you to quickly compare Bed & Breakfast establishments in Provence and the Riviera and visit the official websites of 352 Provence guest-houses.. Choose a departement and select your bed & breakfast according to your price and comfort criteria: with or without swimming pool, with or without table d’hotes, then book your bed & breakfast in Provence with the owner directly..
Provence Web gives you a selection of bed & breakfast websites for Provence and the Riviera: from the most luxurious guest-houses in Provence to traditional Provencal guest-houses in the hinterland, you will be able to choose from a selection of more than 350 guest-houses and 1,100 bed & breakfast establishments in Provence, Provencal Drome and the Riviera..
Baux de Provence - St Remy - Eygalieres - Maussane les Alpilles. Our B & B adds offers you a photo and a quick description of the guest house, the range of maximum prices in high season and the minimum price in low season that you will pay on the basis of a bed and breakfast for 2 persons for one night with breakfast included. To quickly find the bed and breakfast that suits you, you can refine your search for bed and breakfast on Provence web by crossing several qualitative criteria. To find a cheap bed and breakfast you can select the minimum price range to less than 60 euros or between 60 euros and 80 euros which is still a fairly economical price for the region. The average price of a bed and breakfast is around 80 to 100 euros for 2 people with breakfast. If you prefer to stay in a bed and breakfast of charm enjoying high comfort and high quality services, in a prestigious setting, you can choose guest houses in a price range corresponding to a higher standard over 100 euros. The pictograms on the ads tell you if the guest houses are open all year, if the guest room has wifi and air conditioning. You are also indicated the cottages with swimming pool, parking or garage to secure your car or your motorcycle. You can also recognize accommodation that accepts pets. If you do not want to leave the bed and breakfast for dinner, you can select the guest houses that offer the table d'hotes. Some guest houses offer a table d'hôtes, but it is not systematic. In this case, these guest rooms will show you the best addresses of restaurants that correspond to your tastes and your budget. You can follow their advice, your hosts have taken the care to test for you beforehand these restaurants. The guest houses that offer a table d'hotes in general prepare a dinner with a single menu prepared home. The meal consists in principle of a small appetizer, a starter, a dish and a dessert. It's not exactly like in the restaurant, there is no card with a multiple choice of dishes. Your hosts most of the time eat with you at the same time, but this is not always the case.